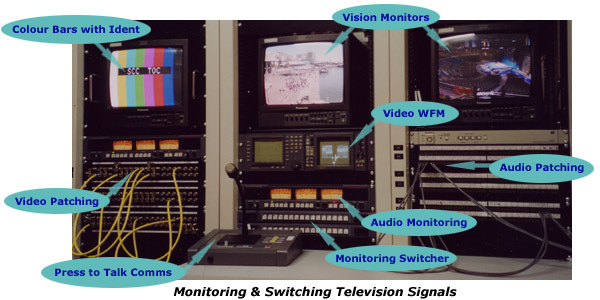 The photo on the left shows a monitoring setup from a typical television technical centre or an outside broadcast (OB) van. When transmitting or recording video and audio, it is important to regulate the voltage level and other characteristics of the electrical signal. A variety of devices exist for checking the quality of sound and vision signals. Some provide measurements, others are for subjective viewing or identification. Click on the picture to learn more about each of the television monitoring or switching devices shown.